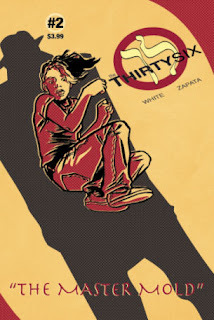 Comics Experience Blog: COMMUNITY NEWS: CE Art Alum George Zapata's "The 36" and Other Comics! COMMUNITY NEWS: CE Art Alum George Zapata's "The 36" and Other Comics! Artist George Zapata was one of Comics Experience's early art students, from back in the days when Andy Schmidt was teaching the courses in New York City. The story is based on Jewish mythology about the world having 36 chosen people. The main character is Noam and he holds the staff of Moses and is the protector of the 36. When a mythical mud monster, known as a golem, goes on a murder spree across the country, it’s up to Noam and his brother to stop it. 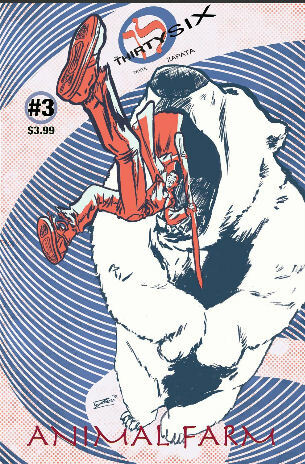 The 36 was successfully funded in a $10,000+ Kickstarter campaign back in August of 2011, and the first three issues are currently available on Graphicly right here, with two more issues on the way! Prior to that, George worked on a comic book called Rockstar Scientists written by Kenny Jeffery. That story follows El, the world's most famous star, on an Earth where scientists rather than musicians command the adoration of millions with wealth to match. Rockstar Scientists is available on Graphicly as well right here. George has also done design work for King Features on their DailyINK digital applications, and even collaborated with Comics Experience writing alum Monika Smyczek on the story Soiled Doves which appeared in The December Project Comics Experience anthology! Like many Comics Experience graduates, George has stayed busy making comics! And we look forward to seeing much more from him. Congratulations, George! You can keep up with George on his website at http://gzapata.net/.